A PowerShell book that I contributed a couple of chapters to has just been released to MEAP, meaning that some chapters are now available for early review by the public. This has been a great experience and fun project to be a part of. I am looking forward to the finished product and hearing what everyone says about the book as well as reading all of the other chapters. Hopefully everyone enjoys it! 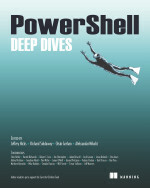 This entry was posted in News, powershell and tagged book, manning, meap, Powershell. Bookmark the permalink. I just ordered it. I have been going over your articles on WPF and Powershell. Thank you for the great info.